Picking VMs manually can be a limitation if your environment moves fast (i.e. having new VMs you need to backup often). In that situation you would previously need to constantly go back and edit the backup job to add new VM&apos;s.
But thanks to smart backup, you now have more flexibility: you won&apos;t select specific VMs, but VMs status/tag/placement at the time backup job will be executed. Let&apos;s see some examples! It means: every VM existing on this pool at the time of the backup job will be backed up. Doesn&apos;t matter if you create a new VM, it will be backed up too without editing any backup job. You now have the ability to intelligently backup VM&apos;s in production pools! 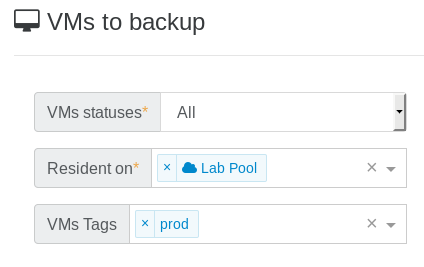 It means any VMs on "Lab Pool" with the "prod" tag will be backed up.